Sliced segments of logs (3″-6″ thick) = instant stepping “stones”, informal paths, bug habitats (look underneath! ), and natural building materials. Look around the community for free logs to slice up into tree cookies. Hardwoods are preferred to soft woods and recently cut wood is preferred dead wood. Red cedar is ideal because it is resistant to decay and the cross-section of the trunks provides cookies with fun shapes. Fixed tree cookies generally have a larger diameter and can afford sitting, jumping, and balancing. Tree cookies that are fixed in the ground linearly create a path. 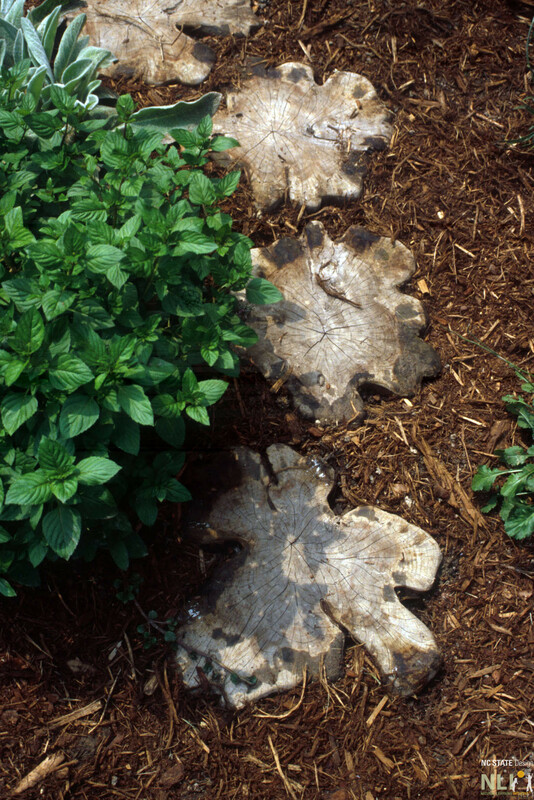 Tree cookies are great stop-gaps if stepping stones are not initially affordable. They will need replacing within two to five years and are not suitable for a permanent path solution. If creating a path, the tree cookies should be a minimum of 4 inches thick. Any rough edges on the top side of the tree cookies should be sanded. To make them last longer, the bottom side of fixed tree cookies could be slathered with polyurethane or oil-based paint to create a barrier against water being absorbed from the soil. Larger logs will require a chain saw with a sharp blade for a clean cut. Loose tree cookies have a variety of potential affordances, including dramatic play, stacking, sorting and hauling. Loose tree cookies can be 1″ – 6″ thick and have a diameter of 3″ – 12″. A radial arm saw or band saw can be used to cut smaller diameter tree cookies. Both cut sides of loose tree cookies should be sanded smooth. Red cedar tree cookies often have fun shapes because of the ridges and furrows of their trunks. 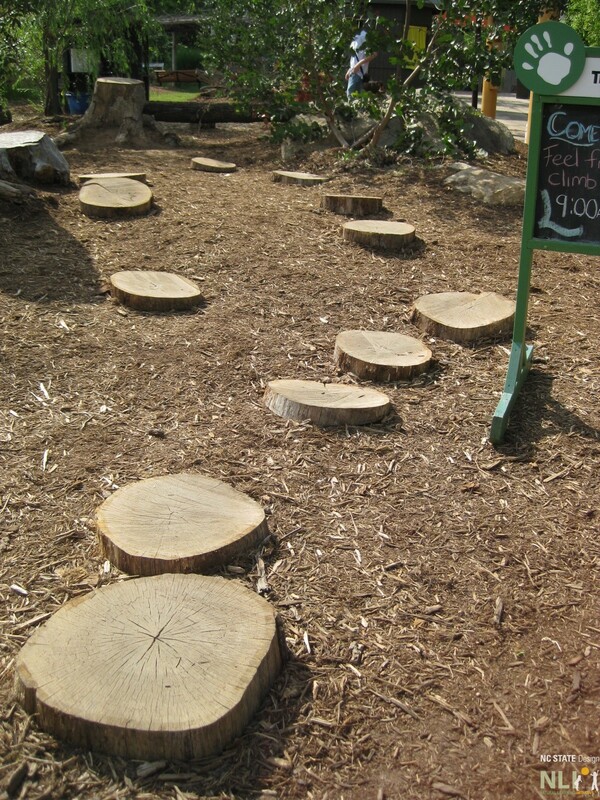 A moveable tree cookie pathway leads to a nature play setting at the NC Zoo’s kidZone. 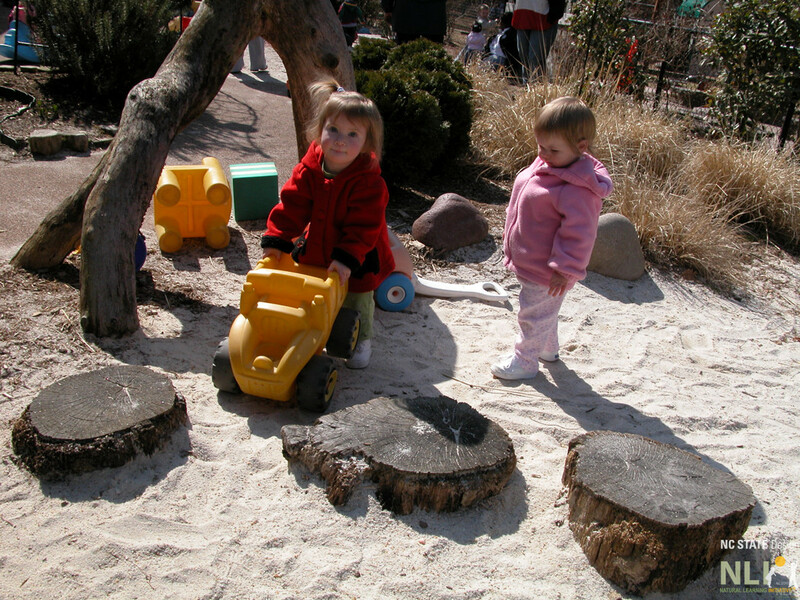 These stable tree cookies are a play surface in this toddler sand play area at Bright Horizons Family Solutions CDC.